This is an introductory trek in the Khumbu Valley offering spectacular views of Everest and nearby peaks. From the base at Lukla (2800m), you walk north along the forested Dudh Kosi Valley to the market town of Namche Bazaar (3440m) via Phakding (2652m). From here you climb north to the villages of Kunde and Khumjung, or west to the monastery at Thyangboche (3867m). There are excellent views of Everest (8848m), Nuptse (7879m), Lhotse (8512m), Ama Dablam (6856m) and many other peaks. From Pangboche just beyond Thyangboche, there is the possibility to walk to Ama Dablam Base Camp or to climb Tawoche Hill (5000m) before heading back along the trail to Namche Bazaar and Lukla. The Annapurna and Everest regions of Nepal have been a ‘must see' destination for the intrepid trekker for over forty years. Up until now, a trekking holiday in these spectacular mountain environments involved either camping or staying at basic tea houses. Now it is possible to trek in these famous valleys while staying at comfortable lodges with all the modern conveniences of a hotel. Our luxury lodges all offer spacious rooms which are pleasantly decorated and with running hot and cold water in an attached bathroom. Best of all, each lodge has been carefully sited to present a magnificent panorama of the Himalaya or surrounding valley from the lodge itself. For those who would like to see both the Annapurna and Everest areas in a single holiday and would also like to do this in comfort, we can wholeheartedly recommend this holiday. In each of these regions we have four days of easy walking. No less spectacular is the way we travel between Annapurna and Everest, taking exciting flights along the chain of the Himalaya. In the Annapurnas we trek in the foothills north of Pokhara through picturseque villages and with a sublime backdrop of snowy peaks. In the Everest region we walk from the high airstrip of Lukla to the Sherpa 'city' of Namche Bazaar, where we have time to explore this thriving town and to visit the nearby villages of Khunde and Khumjung. We can also enjoy world-famous views of Everest and Ama Dablam before returning to Lukla. Using first class hotel accommodation in Kathmandu and absolutely the best standard of lodge available in each of the areas we visit, this really is a 'pampered' trekking holiday. The Mount Everest National Park has been a popular destination for trekkers and climbers alike, since the very first expeditions to the Nepalese side of Everest in the 1950's. 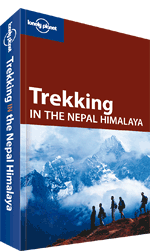 Up until now trekking in this stunningly beautiful region involved either camping or staying at basic tea houses. Now it is possible to trek in the Khumbu staying at comfortable lodges with all the modern conveniences of a city hotel. Our luxury lodges all offer spacious rooms which are pleasantly decorated and have attached bathrooms with running hot and cold water. Best of all, each has been carefully sited to present a magnificent panorama of the Himalayas from the lodge itself. Based around the 'Yeti Mountain Home' chain of luxury lodges - at Lukla, Phakding, Namche Bazaar, Thame and Kongde, this holiday promises the best standard of accommodation in the Khumbu and a whole new way to experience the Everest region. During our 9 days in the homeland of the Sherpas, we trek to Namche and have a day to explore this thriving settlement, before heading on to Thame. Here, we can hike to Sumdur Ridge (4830m) for unforgettable views of a host of big peaks, including Cho Oyu. Our return to Lukla then follows a brand-new trail, traversing rhododendron-covered slopes on the west side of the valley to Kongde, a veritable 'eagles nest' with a unique panorama of Everest Lhotse and Ama Dablam. This is a sensational view which people on the standard 'Everest Trail' do not get to see. A day-hike to the excellent viewpoint of Farak Ri for an even more expansive outlook on the Khumbu Valley is an option from Kongde. Twin bedded and heated rooms, en suite bathrooms and pleasant dining areas can now be a part of your trekking holiday to Everest. This easy Nepal trek in the foothills of Mount Everest starts with an easy stroll on the rim of the Kathmandu Valley, where we gain a first distant view of Everest. A short flight then takes us up into the Khumbu, a region of high peaks and valleys in the shadow of the world's greatest peak. Here, our relaxed week of trekking allows us to experience the unrivalled mountain scenery of the Khumbu, including the classic view of Mount Everest and Ama Dablam from Thyangboche Monastery. Visiting a succession of Sherpa villages, including Namche Bazaar and the charming and quite remote village of Thame, the popular myth of 'Shangri La' will seem all-too-real. On our return to Kathmandu, there is the option of taking an early morning 'Everest Flight' for a dramatic finale. Suitable for any weekend hillwalker, this short trek offers an excellent introduction to the delights of trekking in the Himalayas, including those all-important views of Mount Everest.